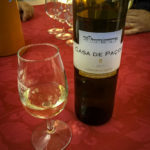 Last week we trekked around the Mercado de Vinhos at Campo Pequena, and it inspired us to dig into our finds from previous fairs (to make room for the new arrivals, of course)! 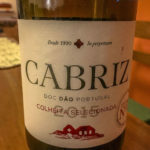 I pulled out this charming red from a producer in Tejo, Companhia das Lezírias. 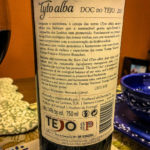 An agricultural and ecologic conglomerate–a main product is rice grown in the marshy lands between the Tejo and Sorraia rivers–they have made wine since 1881. 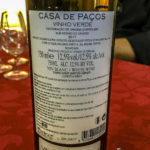 Recently they’ve branched from the traditional Castelão and Fernão Pires grapes to embrace other Portuguese varieties. 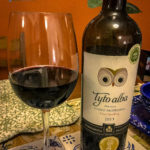 The Tyto Alba (“barn owl” in Portuguese) is a special wine, crushed in lagares and aged at least 12 months in oak. 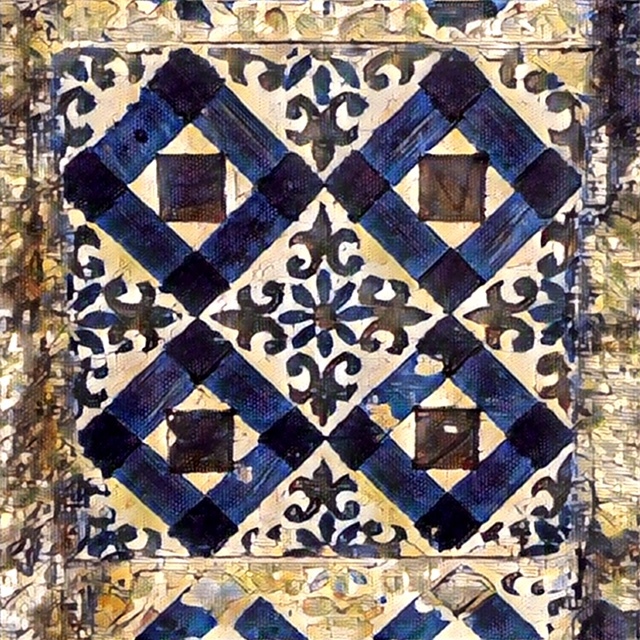 An emblem for the company’s ethic of sustainable management, the owl itself is an integral part of the ecological environment in which the grapes grow. 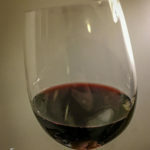 A blend of Touriga Nacional, Touriga Franca, and Alicante Bouschet, the red is soft and elegant, with cassis, violets, and a touch of mint on the nose. It went well with our rendition of Paul Bocuse’s famous Chicken in Vinegar Sauce. 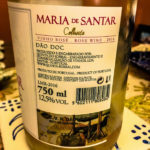 More from the Dão, and a rich rosé to have with the more robust entrées of autumn: From Quinta do Sobral, the Maria de Santar 2016, crafted from Touriga Nacional and Tinta Roriz, which are both prominent grapes in the Dão region. 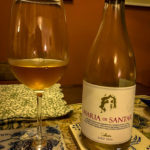 This rosé surprised us with its rich aromas of orange blossom and strawberries, followed by full-on orange and macerated strawberry flavors on the palate. Remarkably, the wine matches in color what it presents in taste–the deep salmon orange nearly glows. 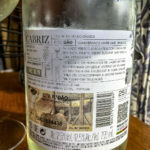 Not bad for a €5 wine at the local market, with a label that appeared to be hastily printed. We enjoyed it with a roast chicken that we’d rubbed in red pepper paste to marinate–a bolder chicken than our usual Sunday roast. 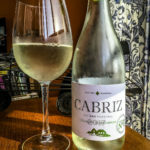 On our tour into north central Portugal last week, we dropped by Quinta do Cabriz in Carregal do Sal on a whim, just after lunch, to see if we might snag a tasting. To our chagrin, one of their enoturismo specialists was on vacation, and the other was book solid for the weekend. But we have the means to make an appointment next time–which we highly recommend for this popular producer. We took a good look at the restaurant too, and it’s worth a lunch or dinner reservation if you’re in the area. 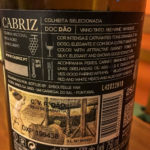 Instead, we picked up two of their popular value wines on sale at Jumbo this week, the Cabriz tinto and branco sellections, and found both to be extremely well made for the price point. It’s hard to call a favorite, as the branco’s fresh and golden with charentais melon aromas and flavors shows off the Encruzado grape, and the rich tinto features the dark cherries and leather aromas of the Touriga Nacional variety. Know you’re in good hands either way. We visited Quinta de Paços last Saturday, and spent half the day walking the vines (as most had been harvested), and sampling wines in various stages of fermentation from the tanks–and tasting a range of whites from Alvarinho and Loureiro to Fernão Pires and Moscatel Galego. The Casa de Paços 2017 blend of Loureiro and Arinto makes for a good introduction to the estate’s style–we’ll have a detailed story in the weeks to come. For the moment, though, you can pick up a bottle of this great everyday white to have with baked fish in a beurre blanc, with its lemon custard tastes and biscuity aromas. These grapes hail from the quinta’s land near Barcelos, within the large Vinho Verde DOC, in the Cávado subregion. 12,5% abv. 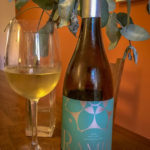 We tracked down another local producer to investigate last week, Manuel Francisco Ramilo & Filho, based in Sintra, which crafts wines from both Sintra and Mafra, just to the north along the Atlantic coast. 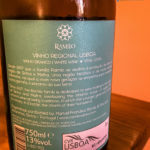 We were especially intrigued to try the company’s Vital offering, as this fresh white grape shows differently throughout VR Lisboa and to the north in Bairrada. At 13% abv, it’s a substantial white, with green apple aromas and following with more green apple peel on the palate. This would be strident, except the wine is balanced with honey notes, and a hint of salinity. A complex and intriguing wine, which we enjoyed with roast pork and Mediterranean vegetables.